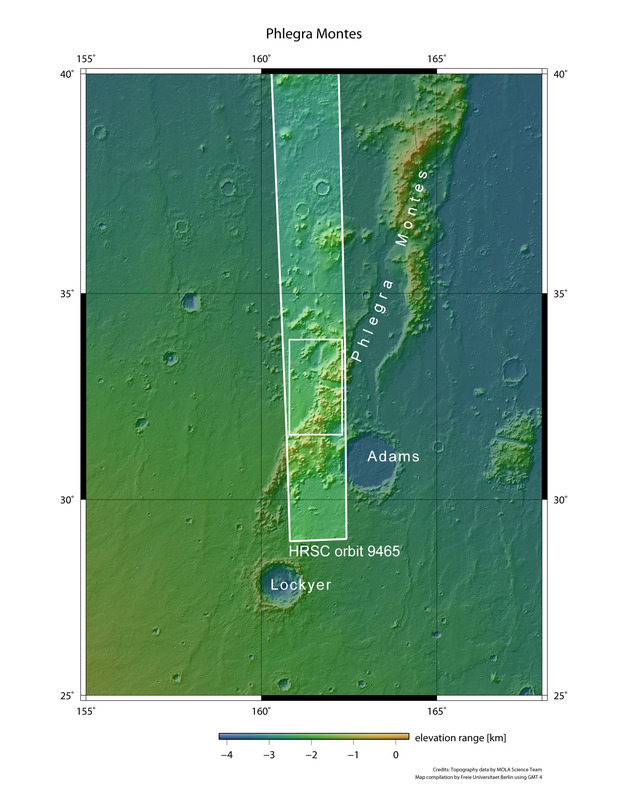 Phlegra Montes is a mountainous massif on Mars that extends for several hundreds of kilometres from the northeastern part of the Elysium volcanic region (between 30 and 50 degrees north) to deep into the northern lowlands. 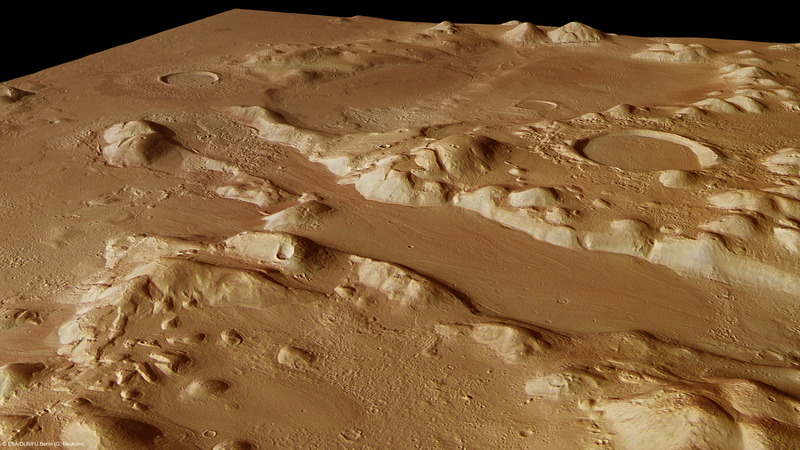 The mountain range consists of numerous rolling hills and ridges, the origin of which can be traced back to tectonic activity caused by stresses in the Martian crust. 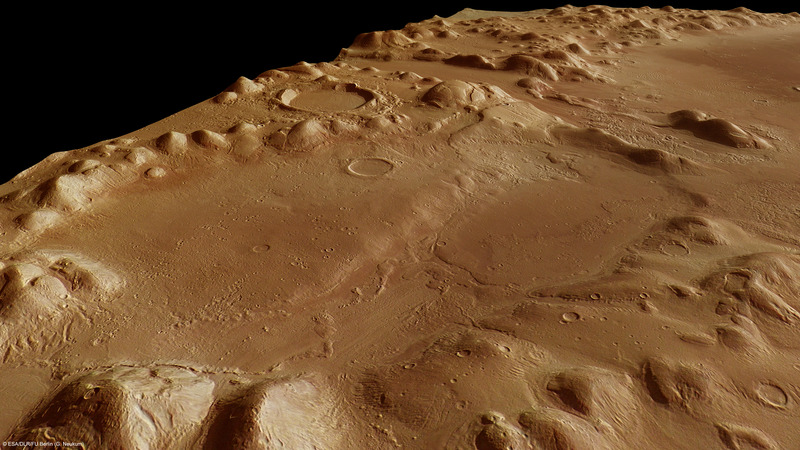 These images of the southern Phlegra Montes were acquired with the High Resolution Stereo Camera (HRSC) on board ESA's Mars Express spacecraft; the camera is operated by the German Aerospace Center (Deutsches Zentrum für Luft- und Raumfahrt; DLR). 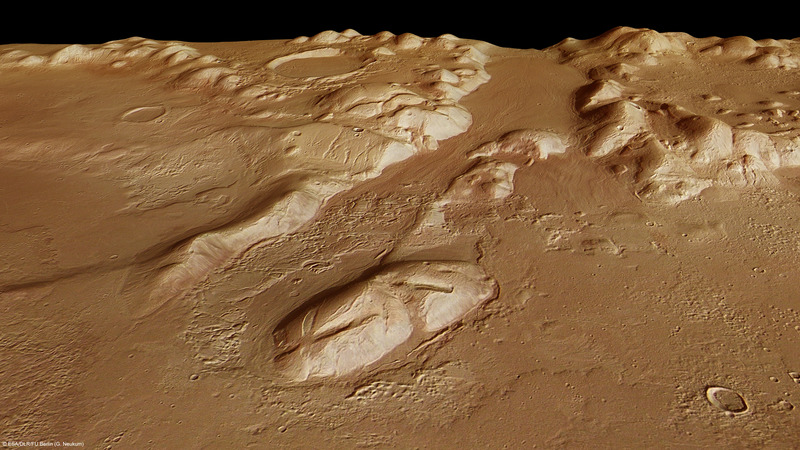 One large valley in which long flow patterns are clearly visible is particularly striking. The valley is almost 50 kilometres long and about 15 kilometres wide. The flow patterns are clearly revealed in box 1 in the black-and-white aerial view and in two of the perspective views. Geologists refer to such flow patterns as 'lineated valley fill'. On closer inspection, it can be seen that almost all of the hills are surrounded by a clearly plastic material (box 2), forming 'lobate debris aprons' at the downstream end. In general, the material appears to be moving downslope from the chains of hills. Several craters filled with material can also be seen, where very similar flow patterns are visible. 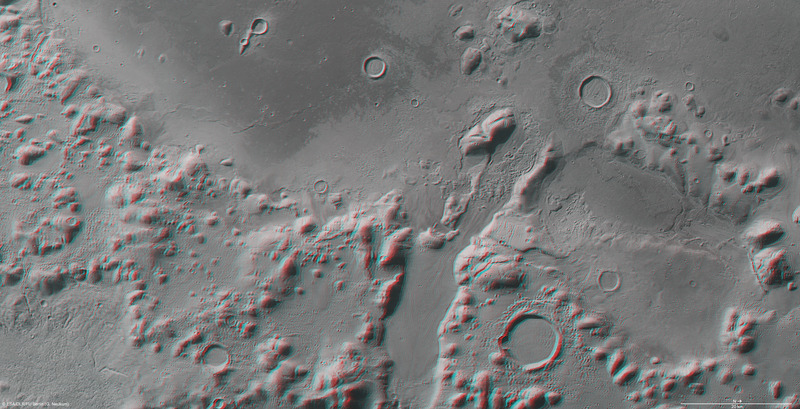 These are linear and trace out circular crater rims in places; they are known as 'concentric crater fill' (box 3). Radar measurements indicate that large quantities of water ice are buried beneath surface of this region. The flow patterns, which are aligned in parallel, bear a strong similarity to the surfaces of 'rock glaciers' on Earth. Such bodies of ice are interspersed with boulders and rocky debris, and primarily occur on Earth in regions of permafrost on high mountain ranges or at polar latitudes. 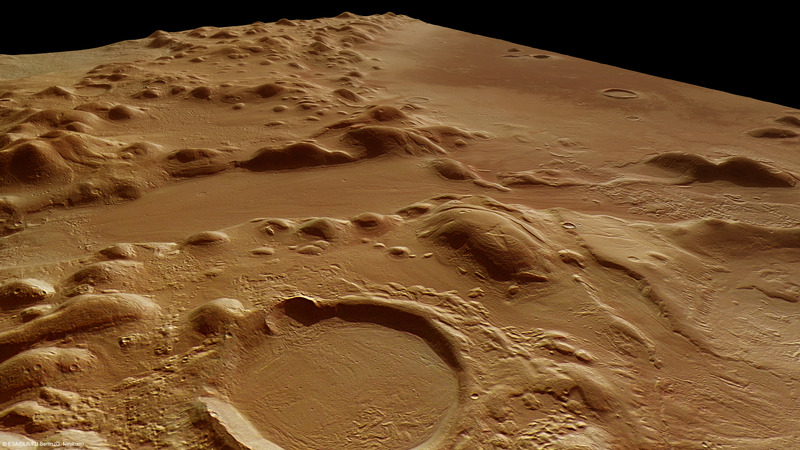 Did glaciers create the linear infill in valleys and craters? It is known from terrestrial rock glaciers that the ice itself is not visible at all on the surface; the scree covering protects it from melting for long periods. On Mars, it is conceivable that rock glaciers slowly moving across the surface of the planet created the structures occurring here. This presumption is not based solely on the evidence of images acquired from orbit. The southwestern branch of Phlegra Montes was imaged on 1 June 2011 from an altitude of almost four hundred kilometres during orbit 9465. The image resolution is about 16 metres per pixel. 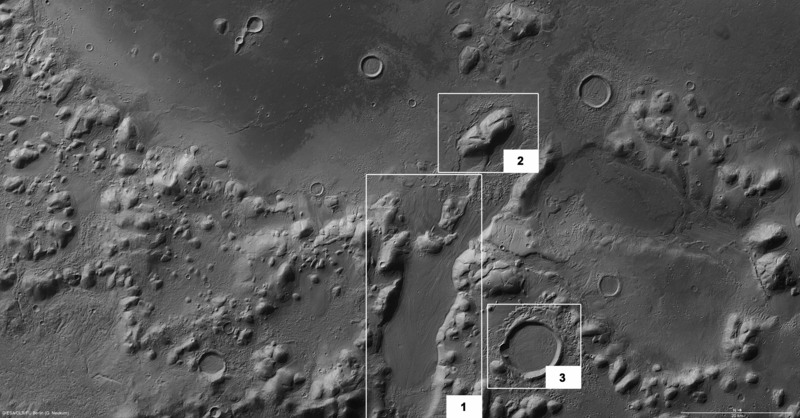 The images show a section at 33 degrees north and 162 degrees east. which has the highest resolution of all the channels. The false-colour view is based on a digital terrain model of the region, from which the topography of the landscape can be derived. 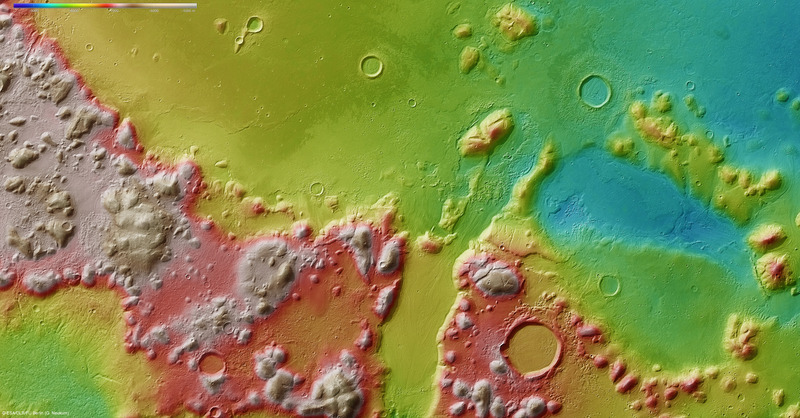 The images were produced by the Department of Planetary Sciences and Remote Sensing in the Institute for Geological Sciences of the Freie Universität Berlin. and Jena Optronik GmbH. The instrument is operated by the DLR Institute of Planetary Research, through ESA/ESOC. The systematic processing of the HRSC image data is carried out at DLR. The scenes shown here were processed by the PI-group at the Institute for Geological Sciences of the Freie Universität Berlin.